I can't believe it's the 30th of October. I don't even know when this happened but somehow it did! I love fall and how everything seems to slow down a little right before the craziness of Christmas. How the weather is always perfect and you can leave your doors and windows open. I am sitting here typing this.. and I don't know what I should write about. I just know I haven't written in a while and it seemed like a good idea. So I am praying that God gives me words to use, to encourage. And I have all these thoughts. You know how people always say when everything is going good in your life, it's easier to trust God, to rely on Him and to seek Him. And when things get hard, we run from Him and we can't seem to see that God is right there, like He always was? 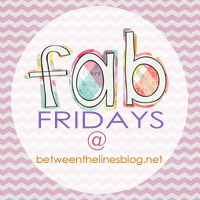 I have never linked up for a post before but I really love the idea of Fab Fridays! It's sooo nice to be reminded of all the great things going on that I should be thankful for! My husband and I started healthy eating this week. For those of you who don't know, my husband is diabetic (type 1) and my family has a long line of heart problems. It's only been a couple days but it feels great! We get to hang out with two of our very best friends tonight for a birthday and I am so excited! Since we moved, we don't see them a lot and I get pretty excited when we can! It's the Holiday season, and I LOVE it so much. The weather is beautiful, pumpkins are everywhere, and of course Starbucks has their famous Holiday drinks right now! I am excited that we have a ladies night out next week with our church. There happens to be a pie baking contest going down and we all know how much I love to bake stuff! My husband is particularly excited because he has gotten to try all the pies I have been making in preparation for said event. Small group was awesome this week. God really spoke to my heart about His faithfulness and I LOVE it when He does that. He is so incredible. We have high school small group every other Monday. The cool thing is we usually get a bigger response at small group then youth sometimes. This particular Monday night though, one student showed up. At first I was a little discouraged. But then I was just so happy that she was there. This would give my other leader and I the chance to connect with her one and one and let her share her heart. Right now we are going through the book of Ruth. I love this book so much. I think I just kinda forgot about it. So here's the deal. My husband had a meeting the other night and as soon as he left I decided I would bake something. I feel as though I may have a problem. And the next thing to happen will be me getting fat. That's right I said it, fat. I have an over abundance of chocolate chips so I decided to search the internet for the best chocolate chip cookie recipe I could find. Which is how I stumbled across this blog. I'd like to say I do my own thing when it comes to baking but for the most part, I am a recipe follower. It's in my nature I guess because I am also a rule follower. It's just what I do. In this case I am so glad I did because these cookies came out perfect. It's also beautiful and fun and so many other wonderful things. I cannot begin to describe how much I love being in ministry with my husband. It's the purpose I had been waiting for my entire life. It's what God had planned for me before I was born and that's amazing to me. But it's exhausting at times. For the sake of being real (and this is hard because I don't know how much I really want to tell the world) I wanted to share some things about ministry that aren't always beautiful and awesome. These things aren't meant as a discouragement but rather an encouragement to recognize that even after all these silly things, God is still doing so many wonderful things that I would never have had the chance to be a part of had He not called me here. This was my sugar cookie biscuit baking experience last night. I set out the butter. you know so it'd be room temperature. I started getting out all the ingredients. I started measuring the sugar. Problem number 1. I didn't have enough sugar. and it smelled. And side note, it reminded me of something in our kitchen growing up. I am not sure what but it was interesting... I had just bought that sugar a couple weeks ago and transferred it into our canister so I am not sure what happened. Anywho, I wasn't panicking yet so I just went onto plan b. I had some splenda in the pantry and decided to use it instead. Which I think is how the next million disasters started. There is so much wonderful packed in that one verse. First, that the Lord is even speaking to us. That He even cares enough to say, little one, don't be scared I am God, the Almighty and I myself with help you. When I was a nanny, one of the little guys would worry. a lot. D would ask stuff all the time and when the answer upset him, he'd say "but, but, what if..." and I felt so bad for him. I couldn't understand why he wouldn't listen to my reasoning, my logic, but he would let that fear upset him to the point of crying. And my heart would break for him because truth be told, I've done that before and I am a grown adult. And then it makes me realize just how much God cares for us. I've been busy. Dreaming up some yummy desserts. I will share recipes soon I promise. As for my post on 31 days of Gods dream for me, I can't think of a whole lot to say today. I wish I could. Sometimes life isn't everything you thought it would be. Sometimes it's OK to be honest and let everyone know you don't have it all figured out. And that's me today. Admitting I don't have this all figured out. I don't know what God is going to do in my life. I don't know some of the plans He has for me just yet. And that's OK. Right now, I am trying to focus on what He has already done and doing my best at it. Being an excellent wife..
Sundays are so busy for me and my hubby that I doubt you will ever see a post from me on the weekend, but you can count on me to be here bright and early Monday Tuesday morning to share with you. Ooops, sorry! We had small group last night and I was super busy! The more I consider what dreams the Lord has for me, the more He reveals to me dreams that have already come true. Take youth ministry, for example. When I first started going to college, I was just working on an associates degree in general studies. I had ideas of maybe one day becoming a jr. high or high school teacher but hadn't given it a ton of thought. I just knew that my jr. high and high school years weren't the best and if I could help students with that part of their lives I would gladly do so. What are dreams anyways? Where do these desires we have come from? Why are some dreams so much more desirable to one person and not another? I am mostly asking a rhetorical question, at least for me. I know God has put dreams in me. Dreams to love Him and love people. Dreams to change the world for Him and see lives changed so that He can be glorified. The dream to one day be with Him in Heaven. Then the specific dreams that He gives each of us from small to great. Some of the little ones for me are baking my heart out, singing, (which I bet could be big dream for others) and building a home. Some great ones, ones I see far, far away, are becoming a wedding planner or owning a bakery and maybe even getting the chance to counsel women in their lives and marriages. And even some now, that He is already allowing me to live out. Things like being a wife, serving in youth ministry and being a part of a church that really is my family, and owning a home. The little desires that God places in my heart, the things He causes me to love and enjoy, are so important to me since I am trying to figure out what dreams He specifically has for me. I was looking at another friends blog and she took the 31 day challenge here. I thought this was a really neat idea and I am going to do the same. I saw a button for 31 days to dream again and loved her idea behind it. The cool thing about it is I am going to write 31 days of God's dream for me which I already started writing about yesterday! I mean even the title for my blog yesterday has the wording to the verse I found while looking at this blog! It still amazes me that God is in control of everything, knowing before I even wrote yesterdays blog, He would show me this! Just confirms that God is near and still speaking to me personally! Thank you God for taking the time to speak to me. I love you. Looking forward to sharing this journey with you friends. Head on over to This awesome blog to take the challenge with me and check back later today for day 2 of my 31 days of God's dream for me series! One of my biggest desires in this life is to be able to do what I love. The easy answer would be, then just go do that. But how many of us actually get to quit our day jobs and do the thing that we always wanted to? To use our talents as a full time job? So here's my story about that. I have the most awesomest husband, yes awesomest. Although he may not be perfect, he is perfect for me and I am so thankful for him.We were talking the other night about God's sovereignty and predestination if you will. I told him how amazing it was that God knew what kind of husband I would need and then he proceeded to mold Nathan accordingly because He knew I certainly wouldn't work with just any guy. Funny story... Every time my husband and I meet new students or their parents, one of them always assumes I am in fact the student and not the leader. It.never.fails. Not only do they think I am a student but then when I tell them I am actually married to the youth pastor, they shake their head in disbelief. It's gotten to be a joke within our group so whenever anyone new comes, we let them guess my age. I usually get 16-18. Usually no older. So when people kept asking me if I was excited to turn 25, my response was.. "not really, I don't like getting older but still being mistaken for a teen." 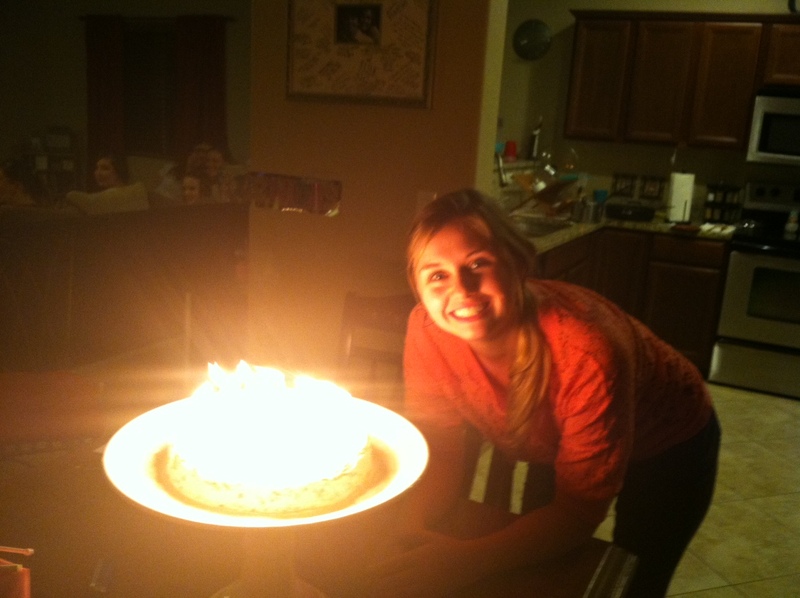 :) Besides that, I had a great birthday. One of the best! My husband spoiled me and threw a party with all our friends. My hubby had a taco bar, Rainbow chip cake, and he even made his very first batch of cake pops while I was out shopping with my best friend. Just when I thought it couldn't get any better all of my wonderful friends and husband surprised me with a kitchen aid mixer!! I am so super excited! I promise to bake my heart out and share it with you all! Here are some pictures of my lovely friends and my party. 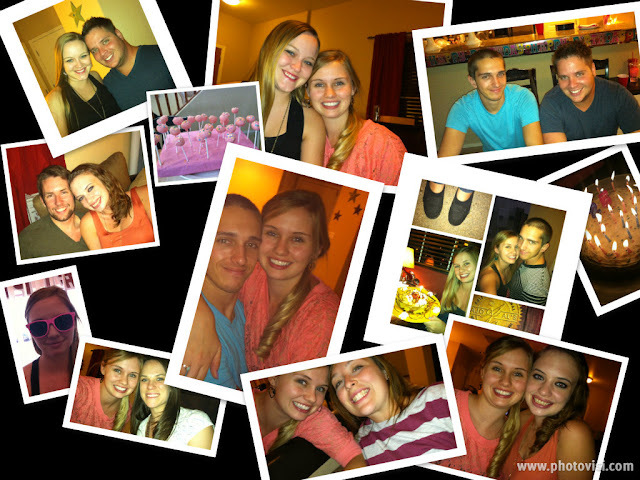 Thanks babe for making it so special. I love you!